I wasn’t a huge fan of pork. We have a preference for free-range meat, but neither do the local supermarkets carry any, nor have I spotted any promising local butchers. I don’t think I can be accused of being a “bunny hugger”, it’s simply that meat from conventional intensive meat production, with the animals fed odd things and kept in cramped, filthy, sickly quarters, tastes funny and seems dirtier than roadkill. I can’t consider food the flesh from an animal raised in quarters whose stench can be smelled kilometers before you zip past on the autobahn. I looked around online to see if any of the local farms might do things a bit differently. We found one, a pork and egg producer, in a neighboring town that operates under Neuland (link in German) certification, a scheme that focuses on animal welfare. There’s a fascinating EU case study of Neuland’s structure and practices in English here. We ordered 10 kg (the minimum order) a few months back. When we drove the meat bin back to the farm, we saw how the pigs are kept. They live in a barn blanketed with clean straw, with free access to an outside corral and a grassy area, all with plenty of room to move around and act like pigs. Satisfied with what we saw, we now get about 10 kilos of various cuts of pork every few months. The quality and flavor of the meat is excellent, and I’ve been won over to pork. Of course, now that we have a freezer full of pork, I have to come up with a bunch of new ways to use it. I’ve had some success with most of the cuts that we’ve gotten, though if anyone has some good ideas for raw (not pickled ) pig knuckle or for ground pork, I’d love to hear them. I can’t find saltpeter, so pickling the knuckle in the traditional way isn’t possible. I was very happy to find, nestled in among the weeds and mystery shrubs surrounding the parking lot, two red currant bushes. One has already produced a small early crop of large red berries. The other seems to be a later sort. This recipe takes advantage of that early crop. Meanwhile, our two zucchini plants have just started producing as only zucchini plants can. The sage and lavender were impulse buys at a local do-it-yourself big box store. The honey is courtesy of our bee-keeping auntie. Some things from the garden, and a bottle of pumpkin seed oil. Serves 2. Pork can be replaced with game hen, chicken, turkey, portabella mushroom or (if you can handle soy) well marinated tofu. If substituting the protein, reduce the honey a little. With a mandoline or very sharp knife, slice the zucchini into 1 – 2 mm thick slices. Arrange on large plates. Thinly slice the shallot, and mince the sage and lavender leaves. Separate the currants from the stem of one sprig. Mix the honey, mustard, and cider. Wash and carefully dry the pork. Season well with salt and black pepper. Lightly dust all pork surfaces with starch. Heat a cast iron skillet on medium high heat, and add cooking fat of choice. Brown pork cutlets on both sides. Turn heat to medium, and add minced leaves, currants from one sprig, and shallot. Once the shallot softens and just starts to brown, remove the meat and set aside. Add the cider mixture, and deglaze the skillet. Reduce to a sauce consistency. Return the meat to the skillet in order to glaze the meat. 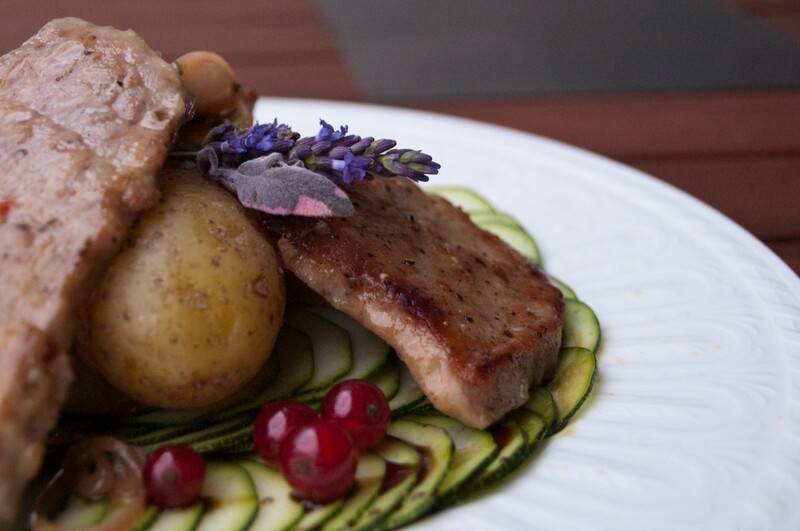 Place meat and choice of potatoes or polenta on bed of zucchini. 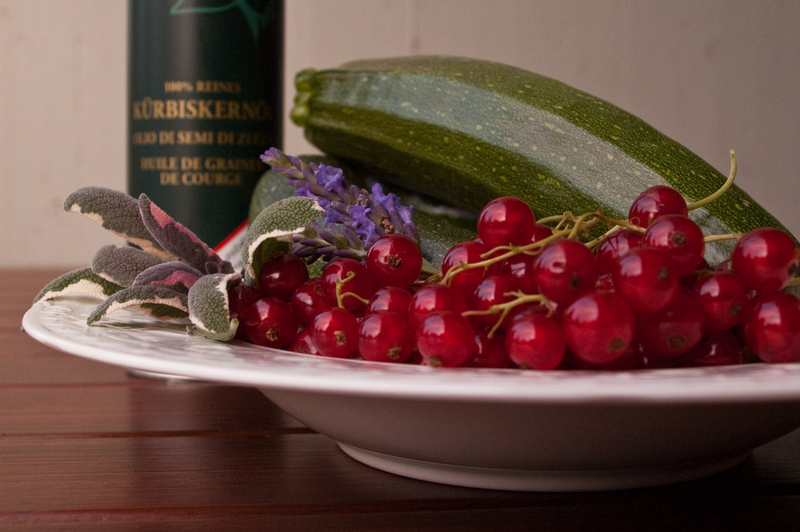 Garnish with remaining red currants, and pumpkin seed oil and lavender flowers if desired. Cider, or a herby dry white wine, or Austrian Schilcher wine are good matches. Completed dish, garnished with fresh sage and lavender flower. I served it with boiled new potato.